Liverpool dropped more points in the League this time against West Ham at Anfield. Adam Lallana opened the scoring and instead of pushing on for more Liverpool sat deep and invited the visitors on to them, back passing far too often conceding a goal to a Mahrez free-kick and then a Matip & Karius mistake allowing Antonio to steal in for a 2-1 lead. 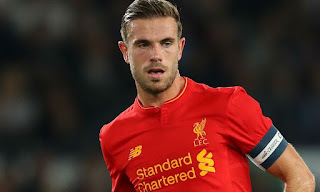 Thankfully Divok Origi's goal evened things up early in the second half but the old habit of back-passing persisted mainly by Jordan Henderson. The Liverpool Captain has been guilty of some negative football in recent games where he passes the ball sideways and backwards instead of getting on the ball himself and driving the side forward. For long periods of the game against West Ham he was negative and cautious in his play but when it dawned on him to finally be more positive he had a great shot that Randolph did really well to tip over for a save, he also found his team mates with better passes though his numerous wasted corners left a lot to be desired. Play on the front foot Hendo, that's how Liverpool win games instead of drawing or losing them.